Do you battle with the removal of persistent spots, water streaks and grime build-ups from your windows? Do they cost you too much energy and you have no will to take part in this household task? This process will no longer consume a lot of your time and energy! The specialists of window cleaning in Canary Wharf are willing to give you a hand! You will be able to use your leisure time as it fits you – the trained and dependable professionals will deal with the washing and polishing. We deliver impeccable cleaning services for all types of windows. Read on and discover more about the different perks you can have. We also provide our professional services in nearby areas: London Arena, East India, West India Quay, All Saints, Island Gardens. You can count on the team - they are the true experts of window cleaning. They all have gone through diverse training, so you can receive efficient help for all glass surfaces kinds. What we can clean includes: single, double, garden windows, bay or sash windows, patio doors, French doors, greenhouses and skylights. Your building can become better instantly with our help. Call us any time you need great window cleaning for your house or business. You can enjoy perfectly looking office with the help of the specialists of commercial window cleaning. You can rely on our high end services for every kind of business premises. For example, if you have a small shop, we can completely wash its windows by using our water fed extension pole system – it allows us to reach up to the fourth floor. If you seek pristine look for the glass panes of a tall business property in London and the nearby areas, we will make use of our rope access equipment. In any case, you will enjoy superb results in no time. 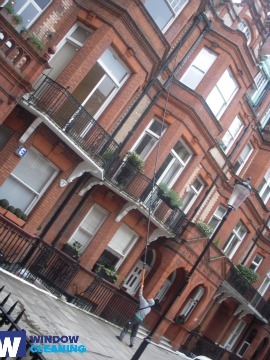 We provide high quality window cleaning by using latest methods. We deliver gleaming and absolutely clean look for your glass surfaces, skylights and conservatories with water-fed cleaning system and jet washing. The poles we use are connected to water supply in our vans, thus eliminating the risk of damage to the exterior of your home or business premise. In addition, we use completely safe rope access equipment to clean glasses on tall buildings. You can profit from these methods instantly – phone us on 020 3746 3113! Profit from our swift and professional domestic window cleaning in Canary Wharf. We can clean the windows of your house in and outside. The detergents we use are eco-friendly - you will love the superb results and be green aware. In addition, we use only purified water. Don't wait, ring 020 3746 3113 and order our second-to-none services. Our customer service agents will guide you – they are accessible 24/7. As an alternative ways of booking – our request-a-service online form or just chat with our representatives.